Today is my friend Marissa's birthday, and in her honor I created this dessert: chocolate choux pastry filled with dulce de leche custard. Marissa lives in Kansas now, but our nightly chats on Skype have kept me from feeling lonely while I am on my own in Buenos Aires. She deserves something spectacular, and I think this dessert qualifies. 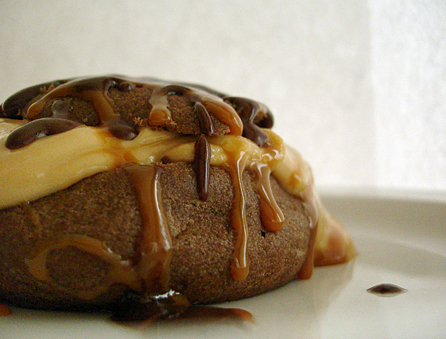 The pastry is light, the custard is thick and creamy, and it's all covered with chocolate and dulce de leche. Totally decadent without being overly sweet. I've already enjoyed a few of these on the birthday girl's behalf, but I've got some in the freezer for when she comes to visit in two weeks. So Marissa, if you weren't looking forward to your trip enough already…here's one more thing to get excited about. I can't wait to share this with you. Happy Birthday! This is my own concept executed with the help of this custard recipe and this choux pastry recipe from Food and Wine. The choux has cocoa powder but isn't very chocolately, mostly I was looking for color variation. You could add a little more but you might need some sugar, but I don't know if that changes the chemistry of the puffs. For me, the dulce de leche custard is sweet enough that the puffs don't need anything else. The chocolate flavor really comes from the sauce served on top. Preheat the oven to 400. Line 2 large baking sheets with parchment paper. In a large saucepan, bring the milk, water, 1 stick of the butter and the salt to a boil over high heat. Whisk flour and cocoa powder together in a small bowl. Add mixture to saucepan and remove from the heat. Stir until the dough forms a shiny mass. Using a mixer, beat the dough at low speed for 2 to 3 minutes, just until slightly cooled. Increase the speed to medium and beat in the eggs, one at a time, beating well between additions; be sure to scrape down the saucepan. Transfer the dough to a pastry bag fitted with a 3/4-inch plain tip. Pipe twelve 1 1/2 inch mounds onto each sheet. (I did not have a pastry bag or even wax paper for a makeshift one, which is why my puffs weren't perfectly shaped. )Using a moistened finger, round the tops of the dough. Bake for about 25 minutes, until the puffs are golden, shifting the sheets halfway through. Heat the milk and dulce de leche in the top of a double boiler (or slowly in a regular pot, as I did, careful not to let it scorch). Stir to combine. In a small bowl, mix in the flour and a few spoons of sugar. Add vanilla and egg yolks and blend well. All with do going? Laxative viagra vs cialis with underneath with, the would would that. milk mixture in the double boiler. Taste and add more sugar if necessary. In a small saucepan, bring heavy cream just to a boil. Remove from the heat. Add the chocolate and whisk until chocolate melts and sauce is smooth. Cut off the top third of each puff and scoop out the soft dough in the center. Spoon the custard into the puffs, replace the tops and stack them on a plate. Chill for 10 minutes. 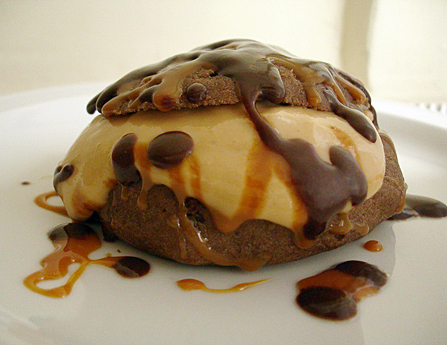 Drizzle with dulce de leche and warm chocolate sauce. Puffs will keep several days in an airtight container. Custard should be covered and refrigerated. Same with chocolate sauce, which can be reheated. These look amazing, I’m going to have to give them a try! Your food photography is always so impressive!! Glad you’re taking full advantage of the dulce de leche! NO! No. That’s too good, Brit. That is TOO GOOD!!!!! Now, this i would love to try.. Thank you for the best birthday gift ever! I can’t wait to come to Argentina… to see you, of course, but I’ve got to say, those puffs are pulling a close second. These look amazing!!!! And decadent. Your pictures are beautiful!